Since my 2 meters handy Rexon RL-102 was too old and not in good condition, I decided to buy something new, like VHF/UHF handheld with DTMF and CTCSS. 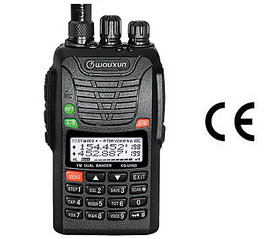 After reading the reviews of radios, I choosed Wouxun latest model KG-UV6D. This radio was praised for good voice quality of the speaker and attractive price. Well.. it was very easy to find a sellers of this radio at InterRadio, but quite difficult to buy it because of long queue! + The quality of sound is very good, amateur stations sound like a commercial FM radio stations. + The buttons do not swing or hang out, pressed with the right effort. In general the overall impression is positive. - The first thing I noticed is the lack of rubber between a battery mounting to the station body, there is even to place for it. What kind of moisture and dust protection according to IP55, or whatever it was, it is, I did not understand. Even the rain is guaranteed to get inside. -Flashlight works only when radio is switched on. Even on cheap gadgets, you can use flashlight without engaging the radio itself. - Quite difficult to find a right button when it is dark. - Zero button is not in place where you expect it! - Weight 261 grams, a bit heavy I think.. I like this Wouxun Handheld , made a surprisingly high quality.